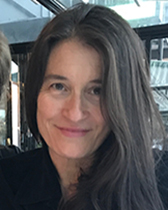 Christina Kiaer (Ph.D., University of California, Berkeley) teaches twentieth-century art, specializing in Russian and Soviet art, the politics of realism and the avant-garde, Comintern aesthetics, the visual culture of anti-racism, and feminist theory. Her first book Imagine No Possessions: The Socialist Objects of Russian Constructivism (MIT Press) was published in 2005, and was awarded an Honorable Mention by the Wayne S. Vucinich Prize of the American Association for the Advancement of Slavic Studies. That year she also published an interdisciplinary volume of essays on Soviet cultural history, co-edited with Eric Naiman, on Everyday Life in Early Soviet Russia: Taking the Revolution Inside (Indiana University Press). Her book Collective Body: The Lyrical Prospects of Socialist Realism is forthcoming from the University of Chicago Press. She is currently at work on a new project, An Aesthetics of Anti-racism: African Americans in Soviet Visual Culture. She is involved in two upcoming exhibitions opening in Fall 2017 on the occasion of the 100th anniversary of the Russian Revolution. She is co-curator, with Robert Bird and Zachary Cahill, of the exhibition Revolution Every Day at the Smart Museum, University of Chicago. She is also a consultant and a member of the catalog collective for the exhibition Revoliutsiia! Demonstratsiia! Soviet Art Put to the Test at the Art Institute of Chicago. Previously, she served as consultant curator on the 2009 exhibition Rodchenko and Popova: Defining Constructivism at the Tate Modern Museum, London, and as a special advisor to the 2011 exhibition Aleksandr Deineka: An Avant-Garde for the Proletariat at the Fundación Juan March in Madrid. She has held postdoctoral research grants from the Institute for Advanced Study, Princeton, the American Philosophical Society, the Social Science Research Council, and the J. Paul Getty Foundation, among others. Professor Kiaer spent the academic year 2015-2016 as a Faculty Fellow at the Alice Kaplan Institute for the Humanities, Northwestern University. Christina Kiaer, “African-Americans in Soviet Socialist Realism: The Case of Aleksandr Deineka,” The Russian Review 75:3 (July 2016): 402–33. Christina Kiaer, "Lyrical Socialist Realism," October 147 (Winter 2014): 56-77. Christina Kiaer, "Collective Body: Christina Kiaer on the Art of Aleksandr Deineka," Artforum 51.3 (November 2012): 243-249. Christina Kiaer, Imagine No Possessions: The Socialist Objects of Russian Constructivism (Cambridge: MIT Press, 2008).